The Hero Picture is a hallmark of Antarctic Travel. Everyone has to pose with the pole, or with their telescope, or something - to prove they were here. I haven't yet done my photo shoot with the pole, but since station close was rapidly approaching, all wakeful members of SPT decided to have a photo shoot on the telescope. 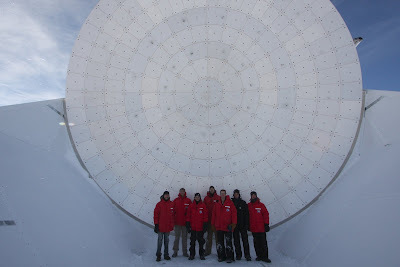 We all climbed up on the secondary support (the arm that holds stuff out in front of the large dish), and posed for a group photo. It's hard to tell from a distance, but up close and personal, the 10m really is a big machine. Will you guys get OUT of the WAY? I can't see the telescope!